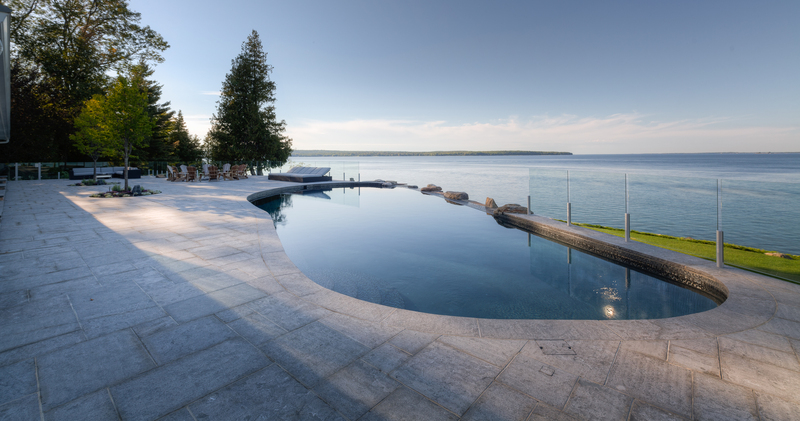 Toronto, (Ontario), January 19, 2017 – BonaVista Pools wins the coveted award at the Landscape Ontario Awards of Excellence, including top water feature category for a large scale residential pool property in Penetang. A BonaVista pool also receives an honorable mention for a Toronto area urban backyard space designed by Pro-Land. The Penetang residential, winning pool, was a large project built over several months which includes: a negative edge pool, an exquisit mosaic tiled hot tub with custom floating covers; concealed in the floor under retractable panels which enable the covers to rise and open on the surface like a flower in bloom. The negative edge cascades over a 25 foot high stone wall overlooking Georgian Bay. This gorgeous pool has the ability to operate all four seasons with the support from the pool cover technology. “BonaVista always enjoys working together with our clients and trades people to create dream projects! 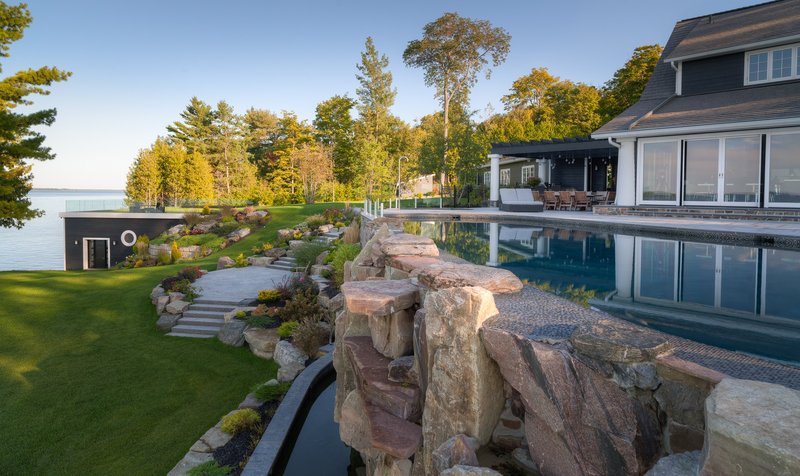 Our clients push us to deliver a unique perspective and challenge us to “colour outside of the lines” to create pools with amazing features like sheer descents, negative edges, integrated hot-tubs and projects that are truly an outdoor oasis”, says Melissa Brown, P. Eng., President BonaVista Pools. Landscape Ontario Horticultural Trades Association holds an annual juried competition to recognize excellence among its members, provide opportunities and raise the bar for the industry. The program is open to Active and Interim members of the association. The Awards were created to recognize and inspire. They also stir the competitive spirit and stimulate advancement, achievement and improvement. HARD LANDSCAPE TECHNIQUES (quality of workmanship, installation techniques, craftsmanship, quality of materials used, execution of construction details, overall appearance, installation challenges encountered, unique use of hard/soft materials, completeness of installation. PLANT MATERIAL: Horticultural correctness, integration of materials, compatibility with environment, quality of materials used, seasonability, harmony, colour, unique use of plant material, proper installation techniques. DESIGN: Originality, degree of difficulty, site problems solved, effectiveness and harmony of design elements, integration of plants, landscape, ornamentation, ease of maintenance. BonaVista Pools is a family-owned and -operated business with over 50 years of experience in custom concrete water projects – from sporty indoor pools, chic backyard spas and Zenlike water features to tranquil lakeside landscapes. BonaVista is Italian for “beautiful view,” which was the late Bob Brown’s dream and the mission statement for the company he created for his family: Melissa Brown, Jennifer Gannon and Peter Brown. Bob’s goals for BonaVista were to make clients’ dreams a reality. Melissa, Jennifer and Peter continue to follow in his footsteps. BonaVista LeisureScapes is a 4,400-square-foot outdoor living boutique and showroom in Leaside offering customers the perfect complement to the products and services delivered by its parent company, BonaVista Pools – it’s the one-stop shop for accessorizing your outdoor space. For the BonaVista Pools customer who wants more than just custom pools and spas, “LeisureScapes” is born! The BonaVista LeisureScapes “dream team” is ready to answer all questions about creating urban retreats outdoors. BonaVista LeisureScapes hand-picks local and international products and designs to provide personalized service for each client’s specific “LeisureScaping” needs.